Lawn-mowing season is in full swing, which is great if you have a lawn-mowing business, and sweaty torture if you don’t. You might think that using a mechanical lawn-mower, which would be quieter and less polluting than a gas mower, might make the job more enjoyable. Wrong. It turns the process of mowing your lawn from a resigned, loud and smelly 30 minutes to a two-hour-long ordeal. It’s slower, and you have to push harder, and if you let your lawn grow for more than about four days between mows you’re fucked. 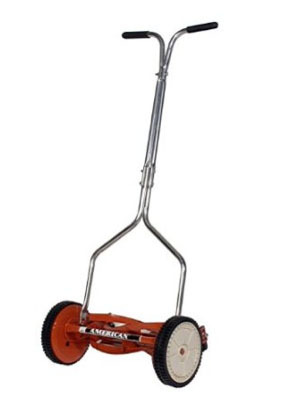 Longer grass gets entangled in the blades instead of being cut, and the cut grass piles up below and clogs up the wheels and blades.